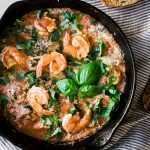 This easy tomato basil shrimp recipe is ready in 20 minutes and needs just a handful of ingredients! Alright. 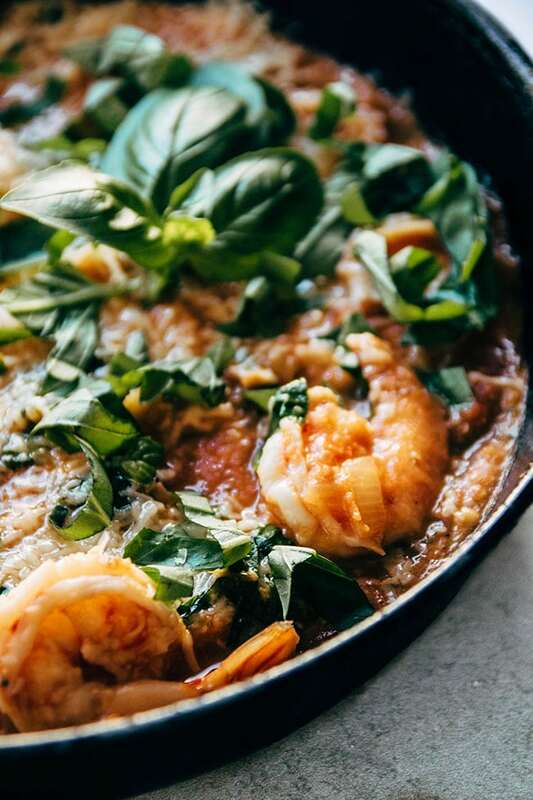 We need to talk about this ridiculously easy tomato basil shrimp. This is the perrrrrrrfect summer-to-fall transition food. It’s warm and cozy but still full of bright, summer tomatoes and plenty of fresh basil. Which is excellent, because I’m right in that sweet spot (errr, bittersweet spot?) where I’m simultaneously pumped to say hello to fall and peeved to say goodbye to summer. Sure, I can once again turn on the oven, roast up a pumpkin or twenty, and enjoy a day at home without sweating my face off (thanks, air-conditioner-less apartment). But at what cost, you guys? AT WHAT COST?! I’m just not ready to quit the herbs and tomatoes and corn and zucchini and beers-on-the-patio yet. Fortunately, I canned sixty pounds of tomatoes last weekend (#boom) and have an indoor basil plant that I’ve SOMEHOW kept alive for more than three days. So it’s baaaaaasically still summer inside my apartment. And kind of also OUTSIDE my apartment, because it was 80 degrees and 91% humidity yesterday. In October. We’re working with my BFF Wild American Shrimp today, because we’re all about sustainable seafood + supporting amazing family fishermen and -women in Life-As-A-Strawberry-Land. 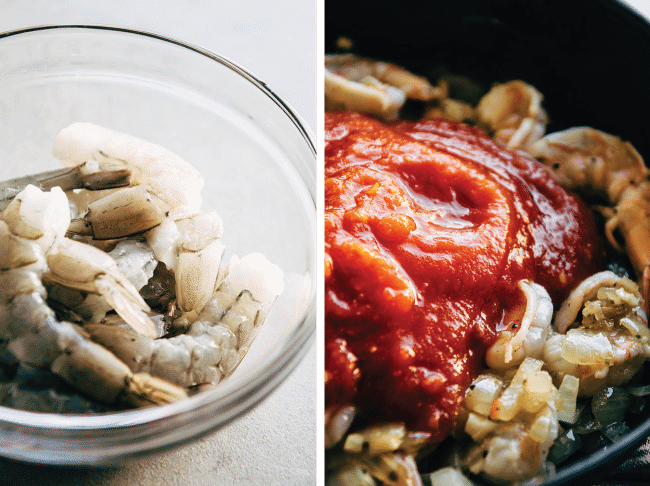 You can read more about why I choose Wild American Shrimp in this post, and if you want to learn more, the American Shrimp Processors Association has a spiffy Shrimp Academy page on their website that walks you through the different shrimp species, sizes, forms, and packaging. I feeeeel like I should also probably mention there’s a pretty dang delectable tomato sauce involved here that’s BEGGING to be slathered on some fresh, warm, cozy bread. Let’s just file this recipe under “excuses to make a loaf of Crusty French Bread,” yes? I think yes. 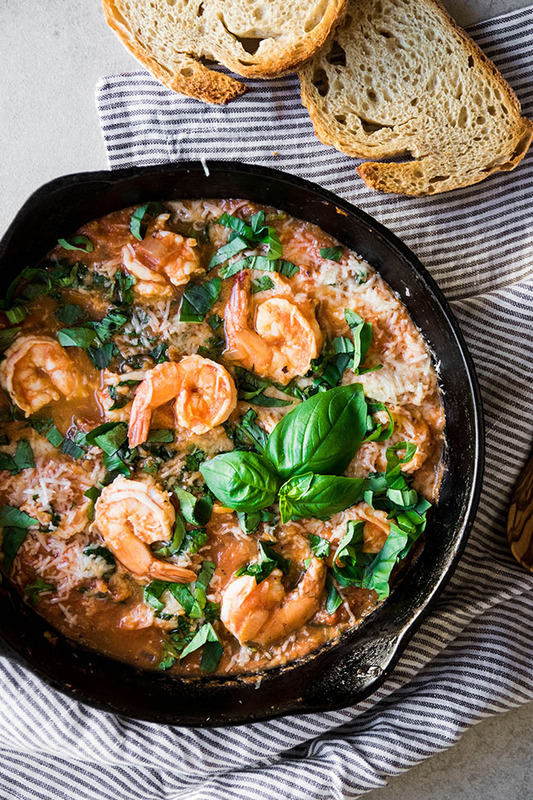 This quick and easy shrimp recipe is great with toast, pasta, or on its own – a great, versatile recipe for busy weeknights! Heat olive oil in a large, deep skillet (I used a 10″ cast iron) over medium heat. Add diced onion to oil and season with salt and pepper to taste. Give it a stir and cook 2-3 minutes until onion has softened. Add shrimp and garlic to skillet and stir to combine. Cook, stirring frequently, for one minute until shrimp have just started to turn pink. Add tomato sauce to skillet and stir to combine. Cook 2-3 minutes, stirring frequently, until sauce is at a low simmer. Add spinach to skillet and stir to combine. 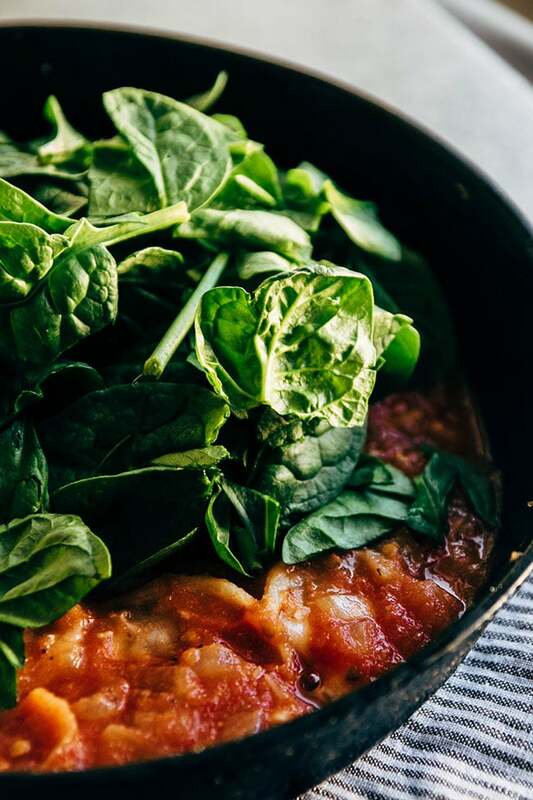 Cook an additional 2-3 minutes until spinach has wilted down and shrimp is cooked through. Taste and add salt and pepper as needed. Remove skillet from heat. Top with parmesan cheese and basil and serve immediately. I used homemade tomato sauce from our summer tomatoes in this recipe – I cook down fresh tomatoes until they’re soft and puree them until smooth. You could also use canned crushed, whole or sauced tomatoes! If fresh tomatoes are in season by you, you can substitute 2-3 large diced tomatoes for the tomato sauce in this recipe. 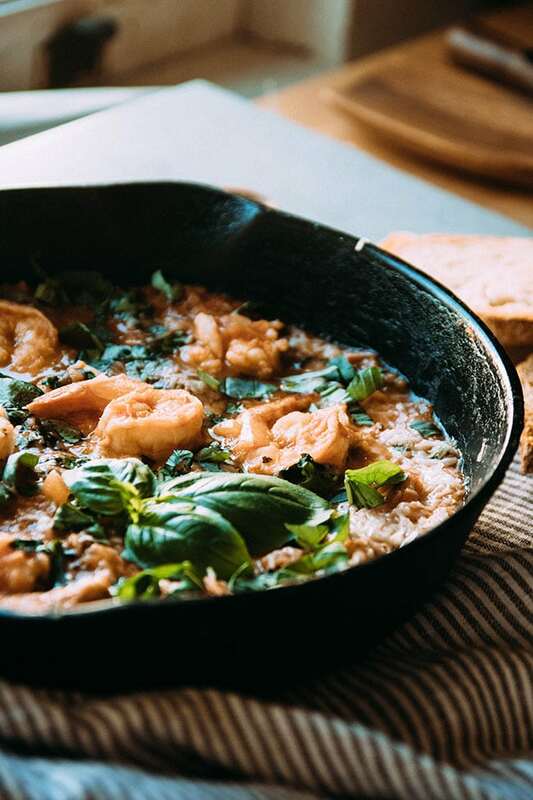 This shrimp is tasty on its own, but I also like to serve it with toast or over pasta. If you use this as a pasta sauce, add a bit of extra tomato sauce or a splash of pasta water to help stretch it further. Add a drizzle of heavy cream to the skillet at the end of cooking for an extra bit of creaminess. A splash of white wine or a bit of balsamic vinegar would also be great in this sauce! I added Sauvignon Blanc as suggested. I also added red pepper flakes for some heat, which my family likes. It was delicious. I live in Alaska and our shrimp are pretty tasty. Nice and easy and great for the campervan!